When you hire Vanguard Home Inspections, you’ll receive a thorough, detailed inspection that will teach you everything you need to know about your new home. We inspect everything on your property, from the roof to the basement and everything between. Your home inspection will typically take 2-3 hours, depending on the size and condition of your property. We perform a very thorough, deliberate inspection, and touch/operate every visible and accessible system, leaving little to chance. We use Thermal Imaging in all inspections where pertinent. Thermal Imaging allows us to see areas of possible concern such as plumbing and air leaks, and pest infestations. Once we’ve identified any issues, we’ll also give you suggestions on how to resolve them. After your inspection, you’ll have a complete and clear understanding of your new home and it’s working systems. Radon Screening: Radon is a naturally occurring odorless radioactive gas that can cause severe health issues for your family, including lung cancer. The state of Connecticut recommends testing all homes for radon. Hire us to check the radon levels in your home and determine if your air is safe for your family. Water Testing: Make sure the water in your home is safe by hiring Vanguard Home Inspections to test your water. Our testing will show any unsafe levels of contaminants or other water problems you should be aware of in your home. Termite/Wood Destroying Insect(WDI) Inspections: We recommend a WDI Inspection for every property. Termite damage is extremely costly and repairs are seldom covered by your homeowner’s insurance. We’ll look for any signs of previous damage and will also note areas of concern for potential future infestations. Once we’ve finished, we’ll provide you with a comprehensive report detailing our findings. Pre-Listing Seller Inspections: If you’re planning to sell your home, please consider hiring Vanguard Home Inspections to examine your property before you place it on the market. We will conduct a full home inspection and let you know of any repairs that should be made before listing your home. A pre-inspected property is appealing to homebuyers since there are no surprises that may impact the sale of the home. You can save valuable time and ensure a smooth and quick sale by having us perform a Pre-Listing Inspection. 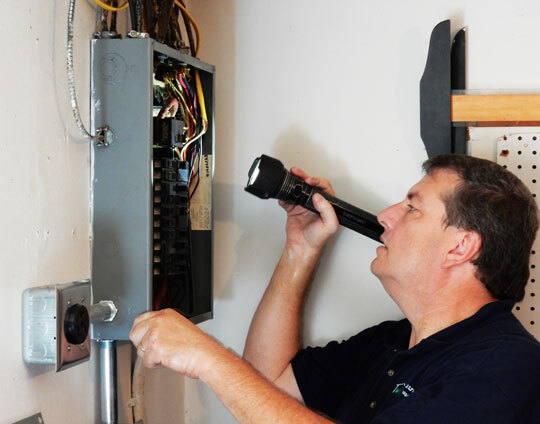 As your central Connecticut home inspection leader, we offer cutting-edge reporting with each of our home inspections. We use HomeGauge Software to deliver a comprehensive 20-40 page report. Your report is more of a media presentation that includes high-resolution images, illustrations, videos, and comments. Everything uncovered at your inspection will be reviewed with you in person and again in this digital report, which serves as a guide to your home. Along with all your inspection details, you’ll have access to an interactive tool called Create Request List. This tool allows you or your agent to show how you’d like to address any issues from within the report, or create your own project list of items to work on in the future. We’ve found this greatly simplifies negotiations and makes communication easier for all parties. 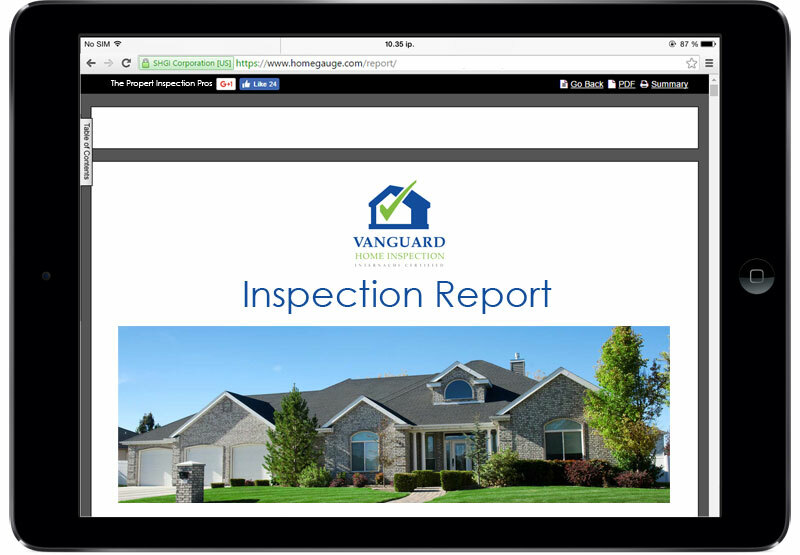 Please take a look at our sample reports here for more on what you can expect with a Quality Vanguard Home Inspection. After your inspection, we are available by phone or email to help with any questions or concerns you may have about your inspection report. Our expertise and advice will give you the confidence you need to make sure the home you’re purchasing will be safe and comfortable for your family. We promise to give you and your property the attention you deserve. Contact Vanguard Home Inspections today<Contact link> and get a clear understanding of your new home and its various structures, systems and components.